You've seen the XKCD comic showing how tweets about an earthquake eventually spread faster than the quake itself, and now here's the proof. Miguel Rios of Twitter's analytics team just posted this visualization of the spread of earthquake-related Tweets. 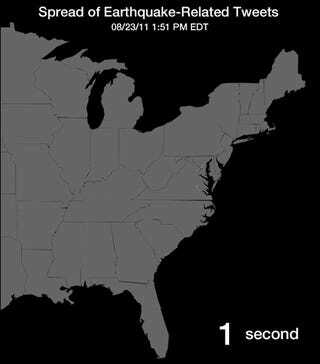 You can clearly see them spreading out from close to the Epicenter in Virginia across the Eastern Seaboard and into Ohio, Illinois, and the Midwest, all in less than 30 seconds. Twitter really does move information at an entirely new speed. But pro tip from a Californian: you should still duck and cover before you grab your phone.